The Federal Highway Administration (FHWA) provides high –quality information to serve Government, industry, and the public in a manner that promotes public understanding. Standards and policies are used to ensure and maximize the quality, objectivity, utility, and integrity of its information. FHWA periodically reviews quality issues and adjusts its programs and processes to ensure continuous quality improvement. FHWA-SA-16-063 2. Government Accession No. 3. Recipient's Catalog No. 7. Author(s) Sarah Smith and Kari Signor 8. Performing Organization Report No. The HSIP 2015 National Summary Report compiles and summarizes aggregate information related to the States' progress in implementing HSIP projects. Progress in implementing HSIP projects is described based on the amount of HSIP funds available and the number and general listing of projects initiated during the 2015 reporting cycle. The HSIP 2015 National Summary Report is not intended to compare states; rather to illustrate how the states are collectively implementing the HSIP to reduce fatalities and serious injuries on all public roads across the nation. The Highway Safety Improvement Program (HSIP) is a core Federal-aid program with the purpose to achieve a significant reduction in fatalities and serious injuries on all public roads. Under the Moving Ahead for Progress in the 21st Century Act, Congress authorized approximately $2.4 billion per year for States to achieve this goal through the implementation of highway safety improvement projects, which is nearly double the amount that was authorized under the previous legislative act. The States not only met this challenge, but far exceeded it obligating nearly $3.9 billion for over 4,100 highway safety improvement projects in 2015. These highway safety improvement projects come in all shapes and sizes. Some HSIP projects are much bigger in scope than others, while other projects include countermeasure installations across multiple sites. The 2015 HSIP National Summary Report provides an aggregate summary of the type and cost of projects across all States. Highlights of the States' 2015 HSIP implementation efforts are provided below. A majority (roughly two-thirds) of HSIP projects cost less than $500,000 each, with 35 percent of all projects costing less than $100,000. About 20 percent of HSIP projects would be considered high cost, coming in at over $1 million each. These projects often include widening shoulders, adding auxiliary lanes, installing cable barrier, installing rumble strips, or modifying traffic signals. Projects associated with a functional class were most often categorized as rural major collector or other urban principal arterial. 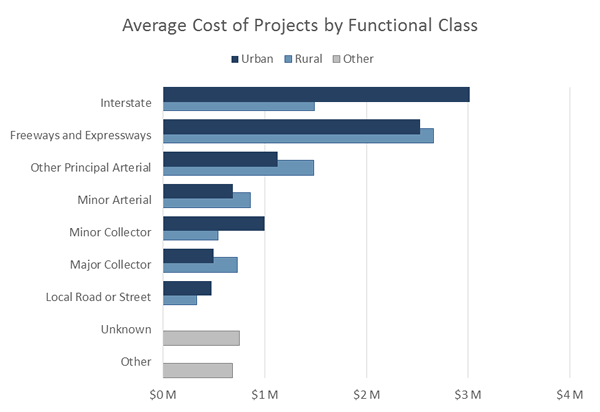 Projects on urban principal arterial interstates had the highest average total cost per project of $3.01 million, whereas projects on rural local roads or streets had the lowest average total cost per project of $330,000. There are fewer urban projects than rural projects but the average total cost per project of the urban projects is greater than the average total cost per project of the rural projects. About 70 percent of highway safety improvement projects occur on roads owned by the State Highway Agency. Projects on roads owned by State Highway Agencies had the third highest average total cost per project of approximately $1.1 million, while projects on roads owned by County Highway Agencies cost just over $400,000 on average. A majority (70%) of highway safety improvement projects falls into the following categories: roadway, intersection traffic control, intersection geometry, roadside and shoulder treatments. 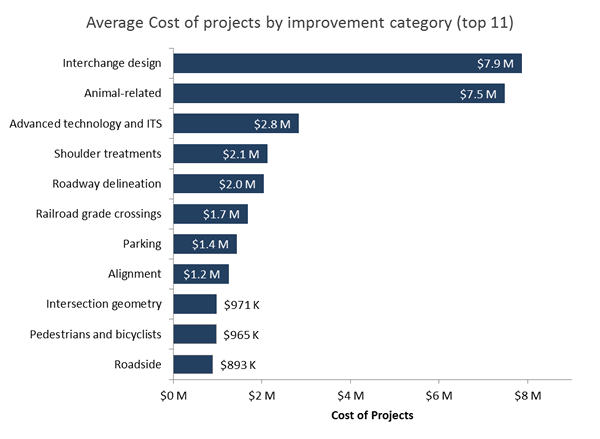 Interchange design, animal-related, and advanced technology and ITS have the highest average cost per project; whereas roadway signs and traffic control, speed management, and work zones have the lowest average cost per project. States use HSIP funds to address the predominant infrastructure-related crash types – roadway departure, intersection, and pedestrian crashes. The number and cost of HSIP projects has continued to increase from 1,684 projects with a total cost of $1.61B in 2009 to 4,188 projects with a total cost of $3.90B in 2015. Over the past seven years, States obligated $16.6 billion for more than 19,000 highway safety improvement projects. The Highway Safety Improvement Program (HSIP) is a core Federal-aid program with the objective to achieve a significant reduction in traffic fatalities and serious injuries on all public roads through the implementation of highway safety improvement projects. The HSIP, similar to other Federal-aid programs, is a federally-funded, state administered program. The FHWA establishes the HSIP requirements via 23 CFR 924, and the States develop and administer a program to best meet their needs. Evaluate the SHSP on a regularly recurring basis. The HSIP 2015 National Summary Report compiles and summarizes aggregate information related to the States progress in implementing HSIP projects during the 2015 reporting cycle. Progress in implementing HSIP projects is described based on the amount of HSIP funds available and the number and general listing of projects obligated as documented in the 2015 HSIP reports. The HSIP 2015 National Summary Report is not intended to compare states; rather to illustrate how the states are collectively implementing the HSIP to reduce fatalities and serious injuries on all public roads across the nation. A summary of available funding and the number and general listing of projects from prior years is available in the HSIP National Summary Baseline Report: 2009 -2012, HSIP 2013 National Summary Report, and HSIP 2014 National Summary Report. 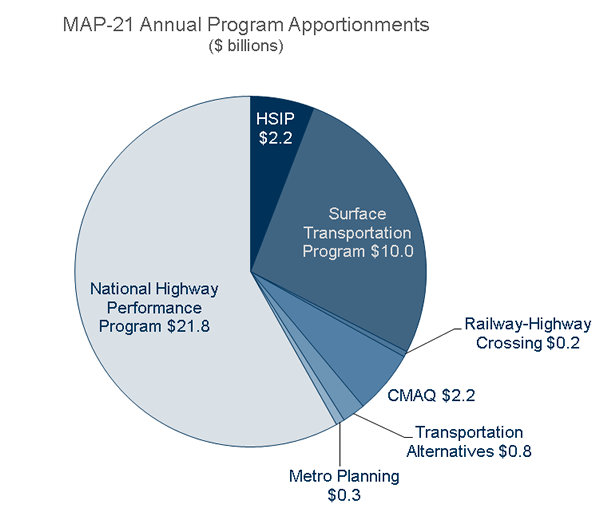 Figure 1 illustrates the distribution of funds across programs under MAP-21. 2% for State Planning and Research (SPR). In addition, if the High Risk Rural Roads Special rule applies to a State, then in the next fiscal year the State must obligate an amount at least equal to 200% of its FY 2009 HRRR set-aside for high risk rural roads. The final HSIP apportionment represents the amount of funding available to States for the advancement of highway safety improvement projects. States provide project specific information for all projects obligated with HSIP funds during the reporting period in their annual HSIP reports. The reporting period is defined by the State and can be calendar year, state fiscal year or federal fiscal year. For 2015, the States obligated $3.9B for 4,188 total projects. These obligations utilized funds apportioned during the 2015 fiscal year as well as HSIP funds available from previous years' apportionments. The following sections present various summaries of the nationwide HSIP project obligations for the 2015 reporting cycle. It should be noted that limited analysis of the project information can be done because not all states have included all of the above information for each project in their annual HSIP reports. Full use of the HSIP online reporting tool and compliance with the most recent HSIP reporting guidance will enable more complete and accurate reporting of national HSIP project data. In addition, HSIP projects come in all shapes and sizes. For example, some HSIP projects may be much bigger in scope than others, countermeasure installations across multiple sites, or non-infrastructure projects (i.e. transportation safety planning, data improvements). Nonetheless, the summaries in the following sections provide a broad scale analysis of HSIP spending in 2015 by project cost, functional classification and ownership, improvement categories and subcategories, and SHSP emphasis areas. The cost per HSIP project in 2015 ranged widely. Some projects were small in scope and cost, such as replacing signs on a particular route. Others were higher cost projects, such as widening a highway or reconfiguring an intersection. Figure 2 shows the breakdown by project cost, grouped into general categories with breakpoints at $100,000, $500,000, and $1,000,000. In 2013 and 2014, the breakdowns were similar. About two-thirds of the projects had costs less than $500K, about 13 percent fell into the $500K – $1M category, and the remaining 20 percent were more than $1M. Figure 3 through Figure 7 illustrate the distribution of projects by the types of roads on which they were conducted. Figure 3 shows number of projects by functional class, following the HPMS classification scheme; Figure 4 shows average total cost of projects by functional class; Figure 5 shows the number and average total cost of projects by urban/rural designation; Figure 6 shows projects by the agency who owns the road; and Figure 7 shows average total cost of projects by the agency who owns the road. 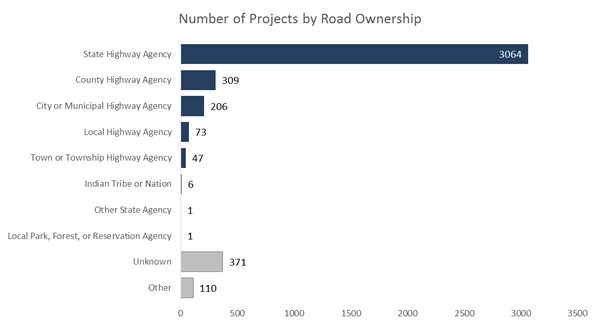 If the functional class or road ownership was not indicated, the project is counted under the "unknown" category. Examples of classifications in the "other" category include multiple functional classes, state or citywide implementation, or non-infrastructure projects. As in 2014, most projects were categorized as "Unknown" indicating that the State did not associate a functional class for a particular project. 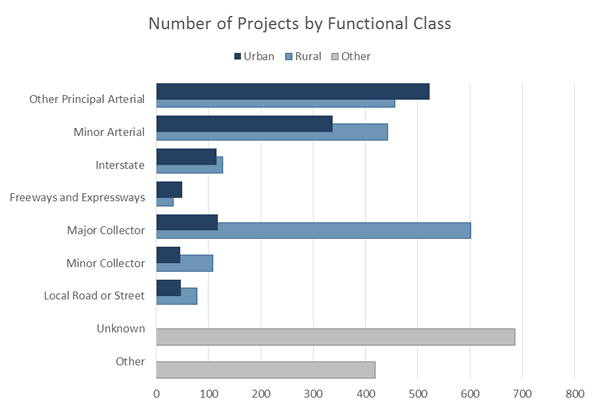 Projects that were associated with a functional class were most often categorized as "Rural Major Collector" or "Urban Principal Arterial – Other". There were 419 projects categorized as "Other" and of those, roughly 250 were categorized as multiple classes or systemic. Roughly another 30 projects were categorized as "n/a" due to the fact that they were non-infrastructure projects. Figure 4 shows the average total cost of projects by functional class. It is important to note that not every project had an associated cost so the average is based on the number of projects which had cost information available. Projects categorized as "Urban Principal Arterial – Interstate" had the highest average total cost per project of $3.01 million (compared to $2.73M in 2014) and projects categorized as "Rural Local Road or Street" had the lowest average total cost per project of $330,000 (compared to $220,000 in 2014). 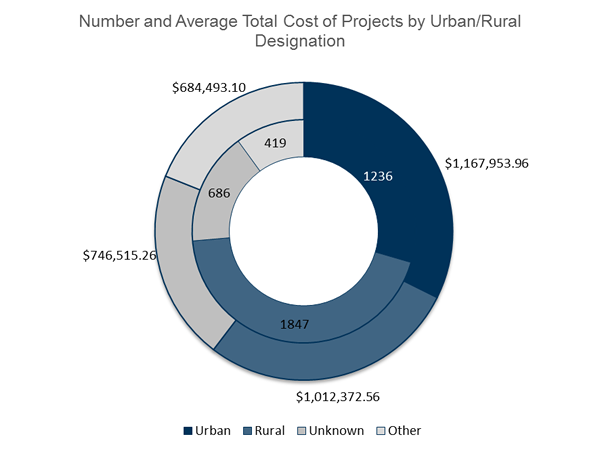 Figure 5 illustrates the number and average total cost of projects by urban/rural designation. As in 2014, there are fewer total urban projects than rural projects but the average total cost of the urban projects is greater than the average total cost of the rural projects. 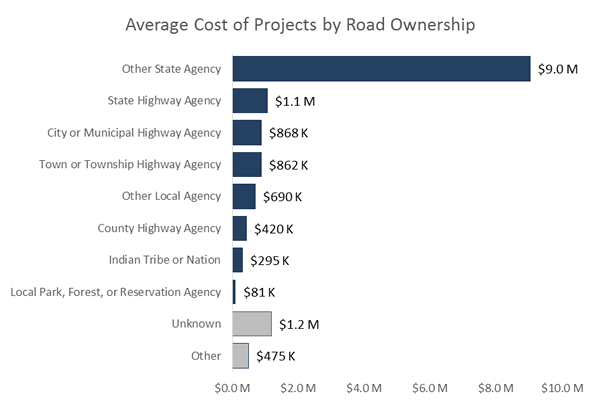 Figure 7 shows the average total cost of projects by road ownership. It is important to note that not every project had an associated cost so the average is based on the number of projects which had cost information available. Projects categorized as "Other State Agency" had the highest average total cost per project of $9 million and projects categorized as "Local Park, Forest, or Reservation Agency" had the lowest average total cost per project of $81,000. Under the HSIP MAP-21 reporting guidance, each project should be assigned a general improvement category and a subcategory under that general category. While a single project may consist of multiple project types, FHWA directs States to assign each project to only one category. The category chosen should align with the primary purpose of the project. 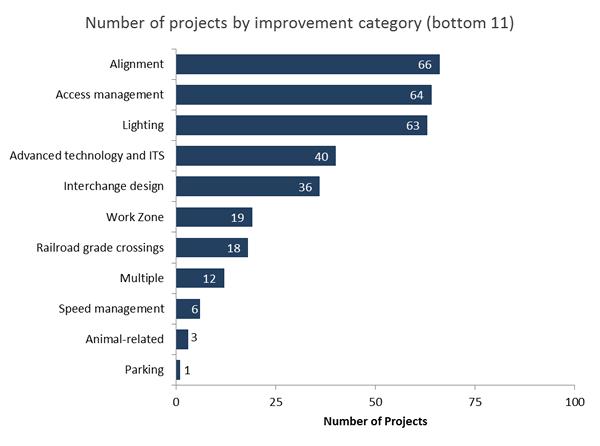 Figure 8 and Figure 9 show the distribution of the number of projects by general improvement category. Figure 10 and Figure 11 combined show the distribution of the total cost of projects by general improvement category. Projects categorized as "Unknown" indicate that there was no general improvement category assigned by the State. 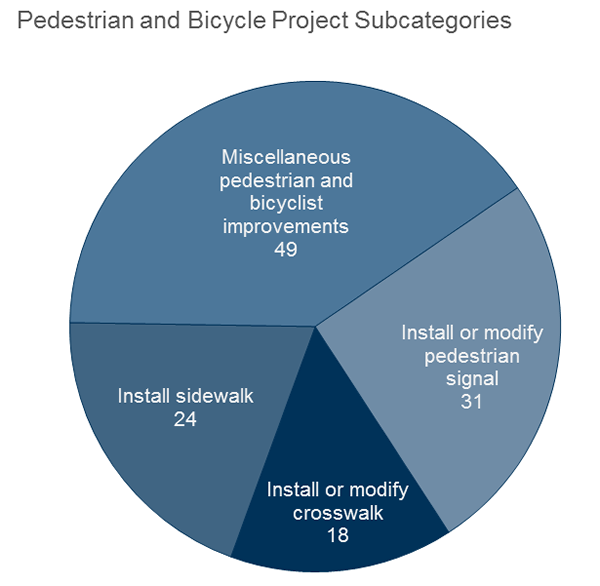 Figure 12 through Figure 16 show the breakdown of the number of projects by subcategory for five improvement categories: Intersection geometry, Intersection traffic control, Pedestrians and bicyclists, Roadway, and Non-infrastructure. More detailed tables with the cost spent in each subcategory are available in Appendix B. For ease of reporting, similar subcategories were grouped together. For example, in Figure 12 below, "Auxiliary lanes – other" combines adding acceleration lanes, adding auxiliary through lanes, adding two way left turn lanes, and several other related subcategories. Figure 8 shows the number of projects by improvement category (top 11) as classified in the HSIP MAP-21 Reporting Guidance. Based on the project information reported by the States, the top five improvement categories are roadway, intersection traffic control, intersection geometry, roadside, and shoulder treatments. 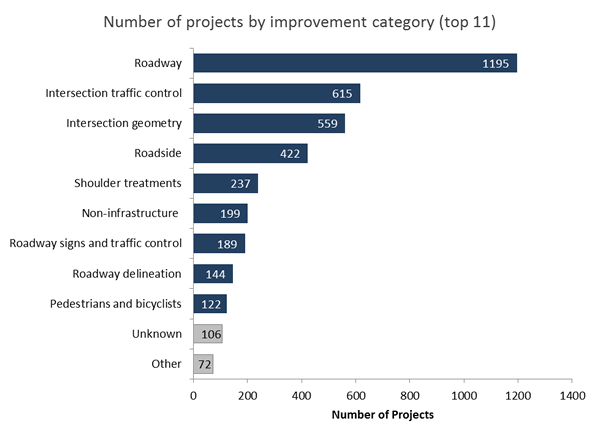 In 2013 and 2014, the top five improvement categories were the same and the numbers of projects classified in each category were similar with the exception of the roadway category. In 2015, there were approximately 475 additional projects classified in the roadway category. The ranking of the remaining project categories was similar in all three years. Figure 9 shows the number of projects by improvement category (bottom 11) as classified in the HSIP MAP-21 Reporting Guidance. In 2014, the number and ranking of projects classified in each category for the bottom 11 were similar. 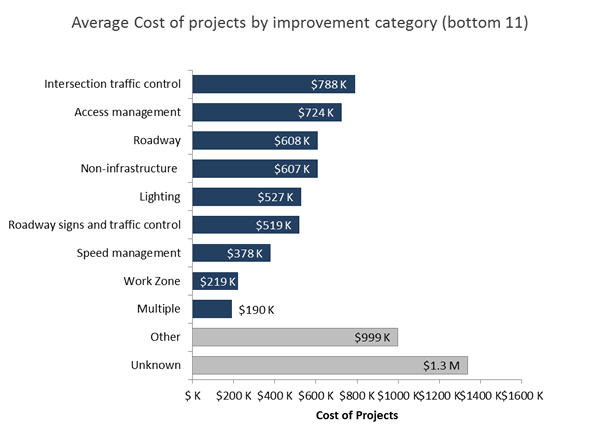 Figure 10 shows the average total cost of projects by improvement category (top 11). Again, it is important to note that not every project had an associated cost so the average is based on the number of projects with cost available. Compared to 2014, the following categories had notable differences in average project costs. Note that the "Multiple" category indicates that a State selected more than one improvement category. For example, the project could include changes to lighting, signs, pavement markings, intersection geometry, and number of lanes. The Intersection geometry category was selected for further evaluation because in 2015 (as in previous years) it ranked in the top five in terms of number of projects categorized and ranked in the bottom 11 in terms of average cost per project. FHWA has also identified intersections as one of three focus areas for the Focused Approach to Safety effort. For the Intersection geometry category, most projects are sub categorized as "Intersection geometrics – other/unknown" (45 percent; 254 of 559 projects), "Auxiliary lanes – add left-turn lane" (28 percent; 155 of 559 projects), and "Auxiliary lanes – other" (13 percent; 72 of 559 projects). 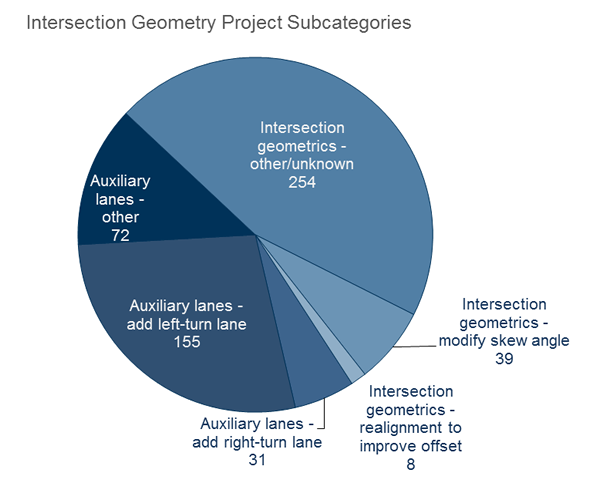 Examples of projects in the "Intersection geometrics – other/unknown" subcategory include modify intersection corner radius and general intersection safety improvement projects. The "Intersection geometrics – other/unknown" subcategory is predominately used without any project description, therefore, no other information is available for these projects. The Intersection traffic control category was selected for further evaluation because in 2015 (as in previous years) it ranked in the top five in terms of number of projects categorized. FHWA has also identified intersections as one of three focus areas for the Focused Approach to Safety effort. 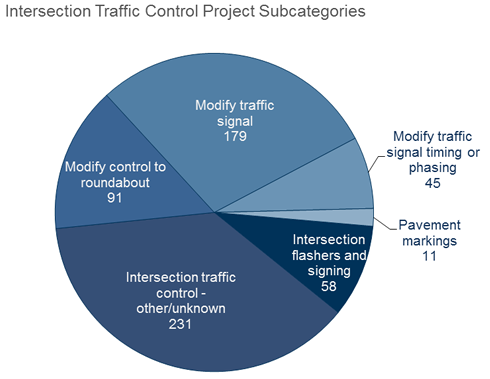 For the Intersection traffic control category, most projects are subcategorized as "Intersection traffic control – other/unknown" (38 percent; 231 of 615 projects) and "Modify traffic signal" (29 percent; 179 of 615 projects). Examples of projects in the "Intersection traffic control – other/unknown" category include projects described as signal and stop controlled systemic improvements and general intersection traffic control improvement projects. The "Intersection traffic control – other/unknown" subcategory is predominately used without any project description, therefore, no other information is available for these projects. Examples of projects in the "Modify traffic signal" category include modernization/replacement of traffic signal and adding flashing yellow arrow signals. The Pedestrian and bicycle category was selected for further evaluation because infrastructure improvements in this category are of significant interest to various stakeholders. FHWA has also identified pedestrians and bicyclists as one of three focus areas under the Focused Approach to Safety effort. 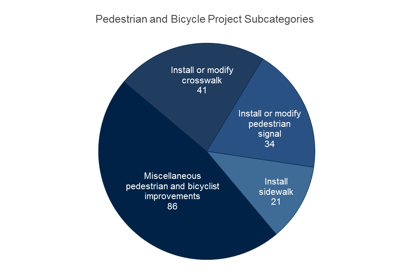 For the Pedestrians and bicyclists category, most projects are subcategorized as "Miscellaneous pedestrian and bicyclist improvements" (40 percent; 49 of 122 projects) and "Install or modify pedestrian signal" (25 percent; 31 of 122 projects). Many of the projects in the "Miscellaneous pedestrian and bicyclist improvements" subcategory do not have any project description, therefore, no other information is available for these projects. The Roadway category was selected for further evaluation because in 2015 (as in previous years) it ranked as the number one category in terms of number of projects categorized. FHWA has also identified roadway departure as one of three focus areas for the Focused Approach to Safety effort. 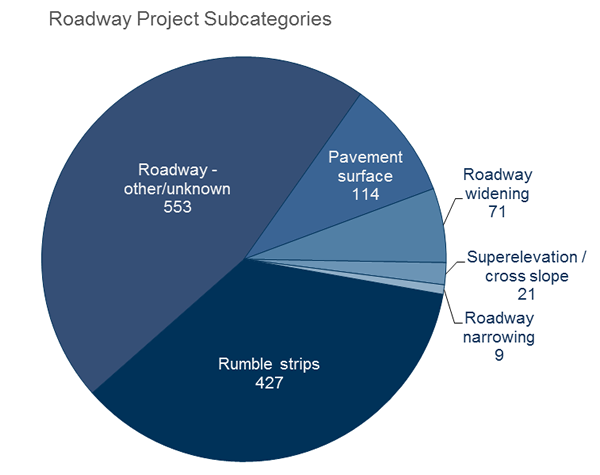 For the Roadway category, most projects were subcategorized as "Roadway – other/unknown" (46 percent; 553 of 1195 projects) and "Rumble strips" (36 percent; 427 of 1195 projects). Examples of projects in the "Roadway – other/unknown" subcategory were projects such as "restripe to revise separation between opposing lanes and/or shoulder widths". The Non-infrastructure category was selected for further evaluation because improvements in this category are of significant interest to various stakeholders. For the Non-infrastructure category, most projects were subcategorized as "Data/traffic records" (30 percent; 59 of 199 projects), "Transportation safety planning" (22 percent; 44 of 199 projects), "Educational efforts/outreach" (17 percent; 33 of 199 projects), and "Road safety audits" (15 percent; 29 of 199 projects). Based on a review of State SHSPs, FHWA identified the eight SHSP emphasis areas common across most States. These emphasis areas are used in the HSIP online reporting tool for categorizing HSIP projects. Figure 17 presents the number of HSIP projects categorized by SHSP emphasis area. For consistency and national reporting purposes, state-defined SHSP emphasis areas were assigned to these emphasis areas, where possible. Please note that States sometimes categorize a single project by several SHSP Emphasis Areas. Therefore, for the purpose of Figure 17 , a single project may be counted more than once. For example, the State recently completed an intersection improvement project that enhanced safety for pedestrians. This project could be categorized as "Intersections" as well "Pedestrians" and is therefore counted once in each category. 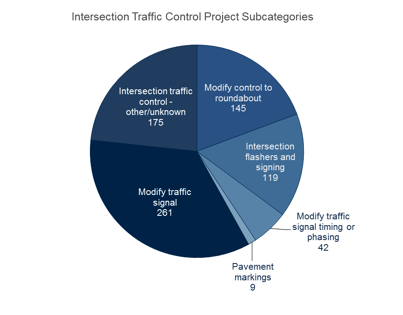 About 42 percent of the projects were categorized as "Roadway Departure" (33 percent in 2014), 31 percent were categorized as "Intersections" (27 percent in 2014), 14 percent categorized as "Unknown/Other" (26 percent in 2014. Examples of other categories used by the States include: "Improve driver decisions about rights-of-way and turning", "Spot safety improvements", and "Curbing aggressing driving". Most states prepared their 2013 through 2015 HSIP reports in accordance with the MAP-21 HSIP Reporting Guidance; therefore FHWA can make a direct comparison of information related to the 2013 through 2015 highway safety improvement projects. As can be seen in Table 3 below, the total number of projects and cost of projects did not change much from 2013 to 2014 but in 2015, there were roughly 900 more projects reported. However, the breakdown in project costs for various breakpoints was similar across years. 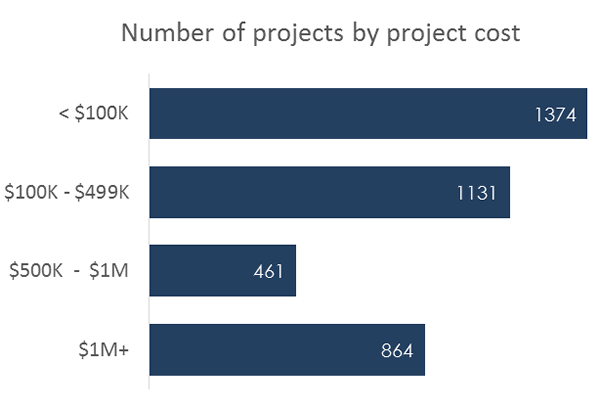 Table 2 shows the comparison from 2013 through 2015 of the number of projects and average total cost of projects for various project types highlighted in this report. For most project types, the number and cost of projects has increased over the three year period. The HSIP National Summary Baseline Report 2009-2012 reported project and cost information for HSIP reports submitted by the States for years 2009-2012. The information from the baseline report is summarized below with the purpose of comparing basic cost and project information to the 2013 through 2015 reports. Table 3 below shows that States obligated $16.6B for more than 19,000 projects over the seven-year period. These obligations include not only HSIP funds apportioned during the reporting period (2009-2015), but also HSIP funds available from previous years' apportionments. *Not all states provided cost data for all projects. The HSIP is a strategic program that uses data and analysis to target safety resources. This HSIP 2015 National Summary Report shows that in 2015, States directed HSIP funds to address the predominant infrastructure -related crash types – roadway departure, intersection and pedestrian crashes, similar to previous years. While the basic characteristics (rural and urban, improvement categories, and SHSP emphasis areas) of HSIP spending remains fairly consistent from year to year, the number and cost of HSIP projects has continued to increase over the seven-year period from 1,684 projects with a total cost of $1.61B in 2009 to 4,188 projects with a total cost of $3.90B in 2015. * Not all states provided cost data for all projects in a given improvement category.